Deshamanya Ranjith Abeysuriya, P.C., former Chairman- National Police Commission (NPC), former Director- Public Prosecutions of the Attorney General’s (AG)) Dept, former President- Bar Association and a member of the Law Commission, passed away. An old Royalist, Mr Abeysuriya was among the first students of the University of Ceylon’s Law Dept with slain Foreign Minister Lakshman Kadirgamar. 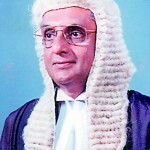 He was also at the Colombo Law College and became an Advocate in 1955. Mr. Abeysuriya joined the AG’s Dept as Crown Counsel and obtained a Master’s Degree in Public Law from Stanford University in 1968, and in 1975, became Director- Public Prosecutions, at the AG’s Dept. In 1988, he was appointed President’s Counsel. In 2002, Mr Abeysuriya served as Chairman NPC. He is the son of late Dr. Fred and Beatrice Abeysuriya of Galle. He leaves his loving wife Indrani and children Rohantha (AG’s Dept), Ajith and Roshani.Remains will leave residence, 12, 28th Lane, off Flower Road, Colombo 7, for cremation at the Borella Kanatte today (25) at 5 p.m.